“Um, Babe?” I heard from the other side of the room. “It’s raining.” I looked up and sure enough there they were. The fat drops of Oregon were back. “Bugger. Well, I’m not running in that. I could, though.” I contemplated running in my wet weather jacket and a cap. “Scratch that,” said my weatherman. “It’s snowing.” The weather was excusing me from planned exercise, as rain was one thing, but I draw the line at running in the snow. We packed instead, and I moved the furniture back when Ben was in the shower – the five minutes of exertion my exercise for the morning. The car packed, we just needed to find somewhere for breakfast. The highway led us to a diner, where the special of the day was corned beef hash with biscuits and gravy. No, really. We had oatmeal and eggs, and listened to the regulars commenting to the waitress that snow in April was a mighty strange thing. We went to the grocery store to stock up on a few necessities for the drive – water, lollies, fruit – the usual. We were practically the only ones in there, and when it came time to check out, we wondered if we really were the only ones in the store. The checkouts were unmanned (or ‘unwomanned’ as it turned out). It seemed that everyone – customers and staff alike were too busy at the window admiring someone’s new car. Apparently, this is a big event in Bandon. With the car, the snow, and the guy who’d left his hat in the diner, causing a minor hullabulloo, the people of Bandon were having a big day. That day we were heading to Portland, and it would be our longest day of driving. We had finished listening to Bill Bryson’s adventure the day before – literally minutes before we pulled into the motel parking lot – so instead we listened to music and select short stories. It wasn’t the same. A Bill Bryson audio book had been an inspired idea on Ben’s part, and on this our longest drive, I missed his dulcet voice and dry wit. 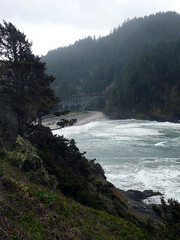 We drove through snow and rain, keeping to the coast as long as we could, before cutting inland to the lacklustre I-5. The roads in between were winding and the hills green and rolling. 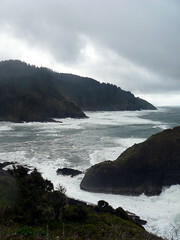 Oregon is, we concluded, a beautiful state. We stopped for lunch at McDonald’s. No, really. It was the only option we could find that we could trust in the small town whose name I forget. We got back on the road, and I fell asleep. I awoke guiltily, having left Ben without company for the better part of an hour. I am usually a far better co-pilot than this, and he had never failed me when I was driving. My penance was the two indentations on my face from my sunglasses, and the dried spittle on my chin. We were coming into Portland. Our NavSat ‘NeverLost’, did not fail us, navigating us deftly to our hotel with her slightly superior sounding voice – at 4 o’clock (4th day in a row!). We checked in and on opening the door to our room, discovered we actually had a suite. “Oh my God. It’s bigger than the Blue Banana!” I exclaimed. I had enjoyed the cozy fireside at the old inn. I had enjoyed our picture window at the seaside motel, but this room appealed to the princess in me. I availed myself of the huge bathroom, unpacking all my toiletries and indulging myself with some ‘Sand-scaping’ (my non-essential ablutions). We changed for the evening, and headed out. As we’d come in, I had collected some brochures from the lobby. 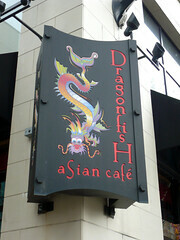 One advertised a sushi place nearby: Dragonfish. They bragged about their cocktails, so we thought this might be the place for us. It was only three blocks from the hotel, but by the time we got there, we were grateful for the warmth inside. Portland was cold that night. 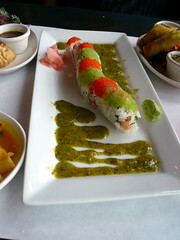 We were seated quickly, and took time over the three menus – drinks, food and a separate one for sushi. We ordered fancy sounding cocktails and were not disappointed. The sushi that followed – three different dishes – was, we determined, THE BEST SUSHI EVER. We stopped eating after two bites each, and ordered a white wine to go with our three sushi rolls. I have never tasted any sushi that was so flavourful, and was presented so artistically. We ordered more cocktails, and then a dessert. By the time we left, nearly three hours later, we were full and a little merry. We discussed whether it was silly to return for lunch the next day, and then decided that we would be silly not to. BEST SUSHI EVER. The next morning we had set aside for shopping. Oregon has no state sales tax, like California and Washington, and we had a few things on our shopping lists that we wanted to get before crossing the border. 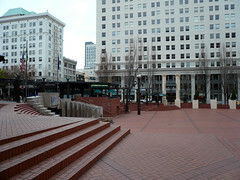 We jumped on public transport – an excellent system of trams that took us to Portland’s largest mall via some downtown sights and a river crossing. We arrived at 10:15, only to discover that Sunday trading had only the week before changed to 11:00. So, what does one (or two) do in a mall that is shut for 45 minutes? We did exactly what we said we would do if the mall was shut when we got there: wandered around with the other stupid people who did not check the opening time, seeing where all the shops were that we would go into when they opened. Makeup and sports shoes. In and out in 60 minutes – well, not counting the 45 minutes of mall-roaming before hand. We headed back the hotel, checked out, and went for lunch. Dragonfish had a different atmosphere in the day, and we opted for an alcohol free lunch, but the food was just as spectacular. 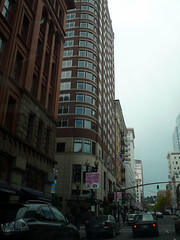 Driving out of Portland, bang on time at 1:30, meant we would get to Seattle by 4. Straight up the I-5, a completely uneventful stretch of road, we were there with 10 minutes to spare. We switched drivers half way, and I drove us into the city. 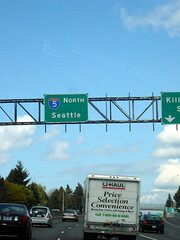 As we rounded a long curving bend in the highway, Seattle came into sight. She is a beauty, and for us both, it was a kind of homecoming. Our road trip was over, but before we returned our car, we drove to our old neighbourhood – where we had stayed when I was here with Ben in January – to do one of the more mundane chores of a trip: laundry. We rewarded ourselves afterwards with a Thai dinner at a favourite restaurant. Travelling like this with Ben is a great joy to us both. We are machine of a travelling team. We each have our strengths, and we use these effectively to ensure that we get to where we’re going, we have a fun time getting there, and we take full advantage of opportunities that come along. Ben and I have a beautiful simpatico, as travelling companions, and as a couple. This type of time together allows us to see every facet of each other, and to forge the best foundation of a relationship: a strong and happy friendship. In short, he is my best friend, and this part of the blog is where I thank him for the wonderful and brilliantly fun trip we had. 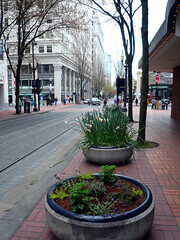 Seattle was brilliant the second time around, but more on that some other time.